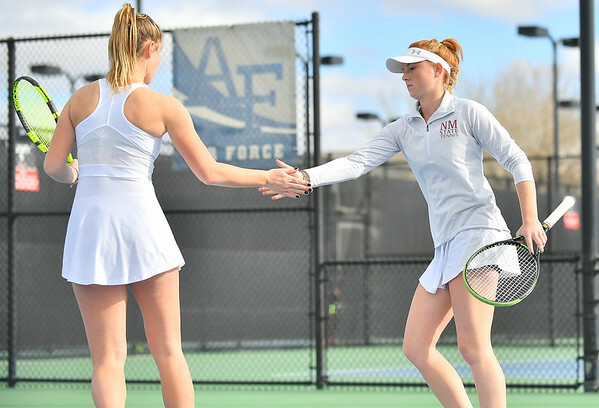 LAS VEGAS, NV - JANUARY 20: Quinty Janssen and Rebecca Keijzerwaard of the New Mexico State Aggies celebrate after winning a point during their doubles match against McKenna Lloyd and Sara Parker of the Weber State Wildcats at the Frank and Vicki Fertitta Tennis Complex in Las Vegas, Nevada. 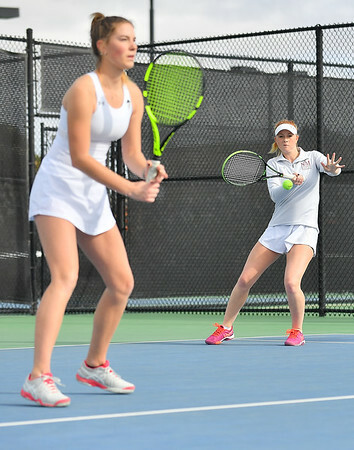 New Mexico State won the doubles match 6-3. 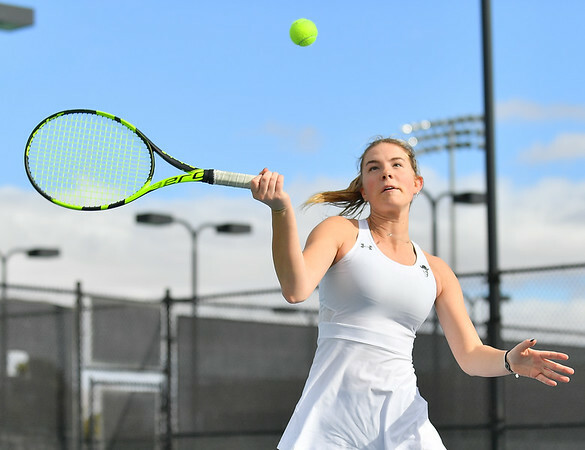 LAS VEGAS, NV - JANUARY 20: Lindsay Harlas of the New Mexico State Aggies plays a forehand during her team's doubles match against Caitlin Herb and Pei-Hsuan (Patty) Kuo of the Weber State Wildcats at the Frank and Vicki Fertitta Tennis Complex in Las Vegas, Nevada. 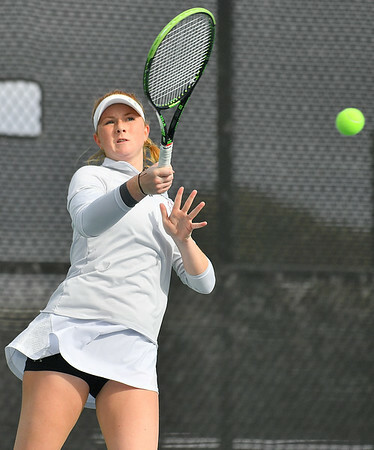 New Mexico State won the doubles match 6-3. 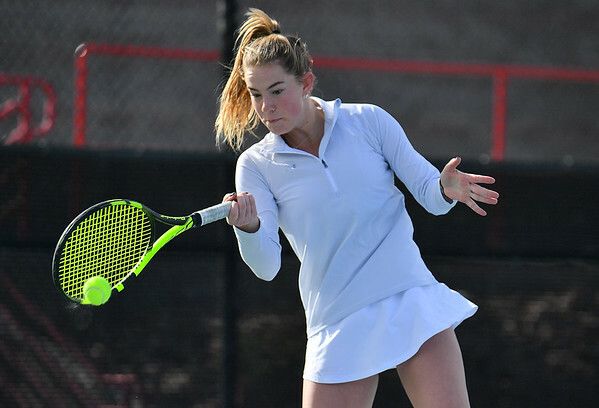 LAS VEGAS, NV - JANUARY 20: Quinty Janssen of the New Mexico State Aggies plays a forehand during her team's doubles match against McKenna Lloyd and Sara Parker of the Weber State Wildcats at the Frank and Vicki Fertitta Tennis Complex in Las Vegas, Nevada. New Mexico State won the doubles match 6-3. 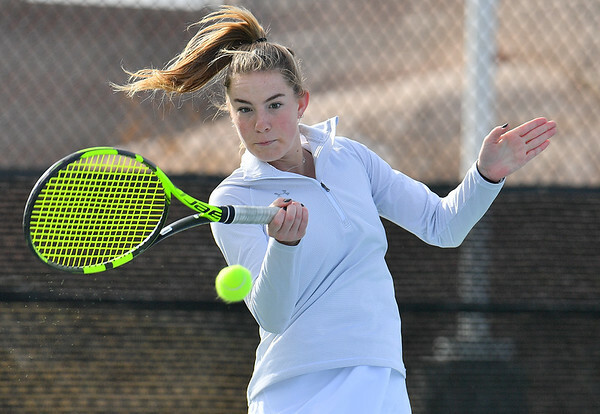 LAS VEGAS, NV - JANUARY 20: Rebecca Keijzerwaard of the New Mexico State Aggies plays a forehand during her team's doubles match against McKenna Lloyd and Sara Parker of the Weber State Wildcats at the Frank and Vicki Fertitta Tennis Complex in Las Vegas, Nevada. 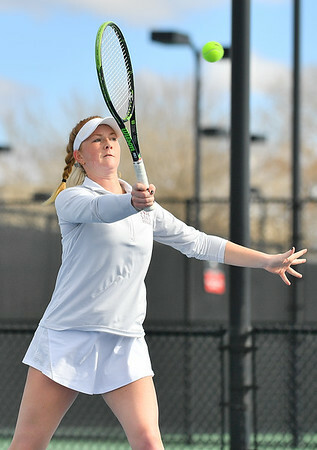 New Mexico State won the doubles match 6-3. 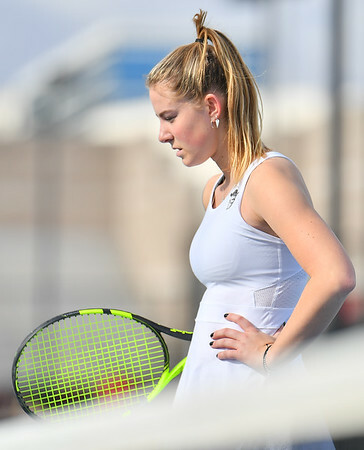 LAS VEGAS, NV - JANUARY 20: Quinty Janssen of the New Mexico State Aggies stands on the court during her match against Morgan Dickason of the Weber State Wildcats at the Frank and Vicki Fertitta Tennis Complex in Las Vegas, Nevada. 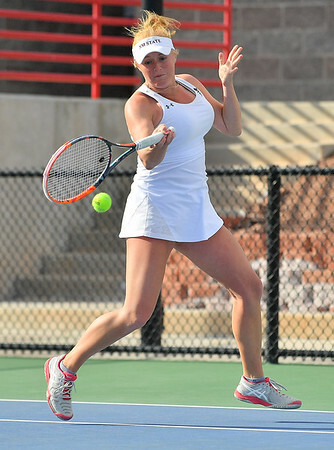 Janssen won the match 4-6, 6-0, 6-3. 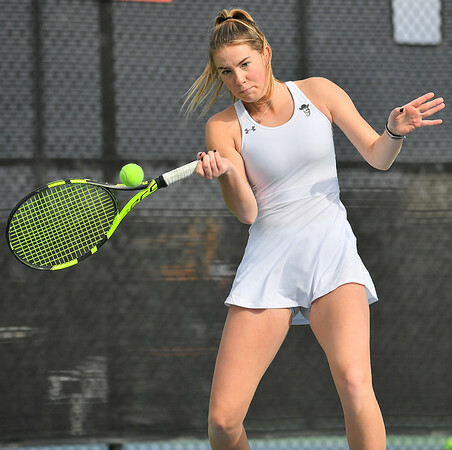 LAS VEGAS, NV - JANUARY 20: Eli Arnaudova of the New Mexico State Aggies plays a forehand during her team's match against McKenna Lloyd of the Weber State Wildcats at the Frank and Vicki Fertitta Tennis Complex in Las Vegas, Nevada. 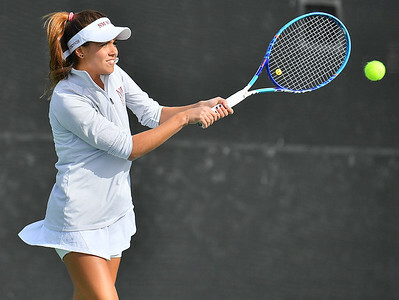 Amaudova won the match 7-5, 6-2. 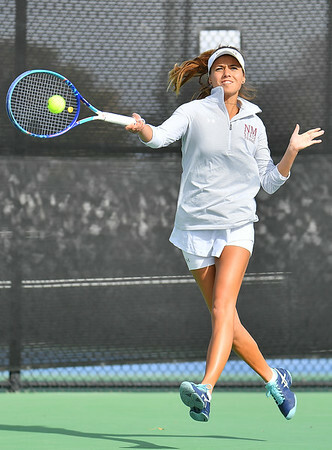 LAS VEGAS, NV - JANUARY 20: Eli Arnaudova of the New Mexico State Aggies plays a backhand during her team's match against McKenna Lloyd of the Weber State Wildcats at the Frank and Vicki Fertitta Tennis Complex in Las Vegas, Nevada. Amaudova won the match 7-5, 6-2. 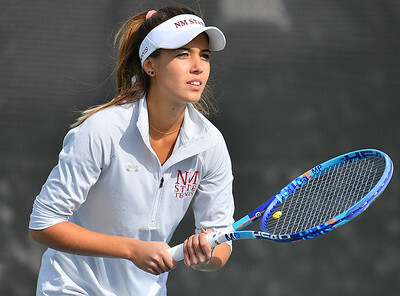 LAS VEGAS, NV - JANUARY 20: Eli Arnaudova of the New Mexico State Aggies prepares to receive serve during her team's match against McKenna Lloyd of the Weber State Wildcats at the Frank and Vicki Fertitta Tennis Complex in Las Vegas, Nevada. 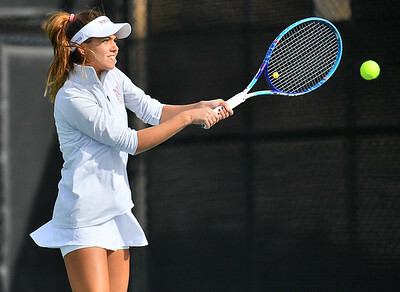 Amaudova won the match 7-5, 6-2. 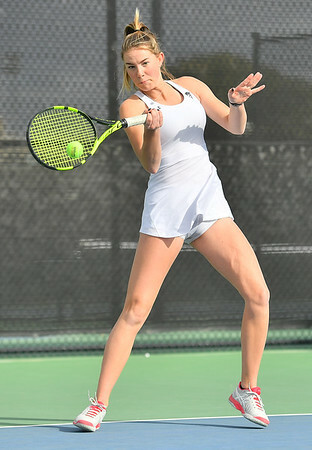 LAS VEGAS, NV - JANUARY 20: Quinty Janssen of the New Mexico State Aggies plays a forehand during her match against Morgan Dickason of the Weber State Wildcats at the Frank and Vicki Fertitta Tennis Complex in Las Vegas, Nevada. 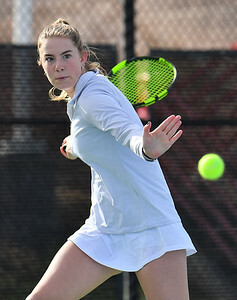 Janssen won the match 4-6, 6-0, 6-3. 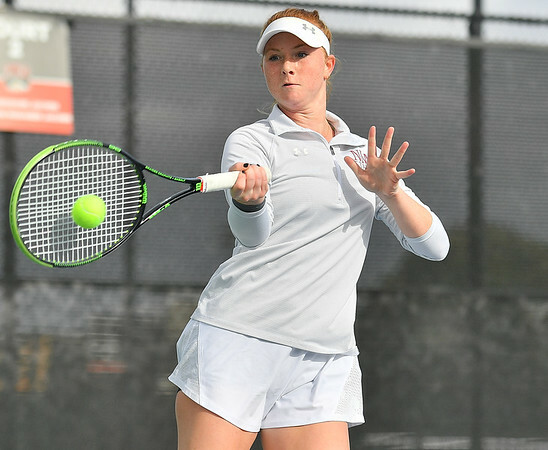 LAS VEGAS, NV - JANUARY 20: Quinty Janssen of the New Mexico State Aggies serves during her match against Morgan Dickason of the Weber State Wildcats at the Frank and Vicki Fertitta Tennis Complex in Las Vegas, Nevada. 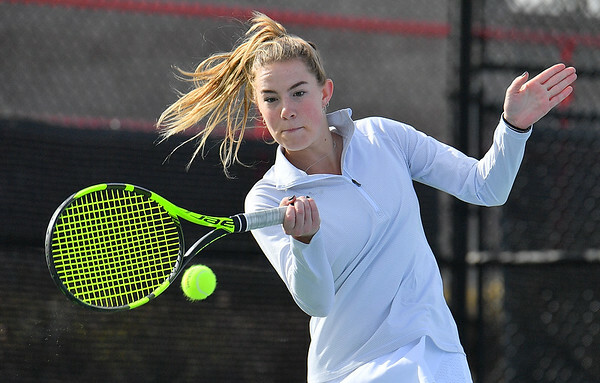 Janssen won the match 4-6, 6-0, 6-3.